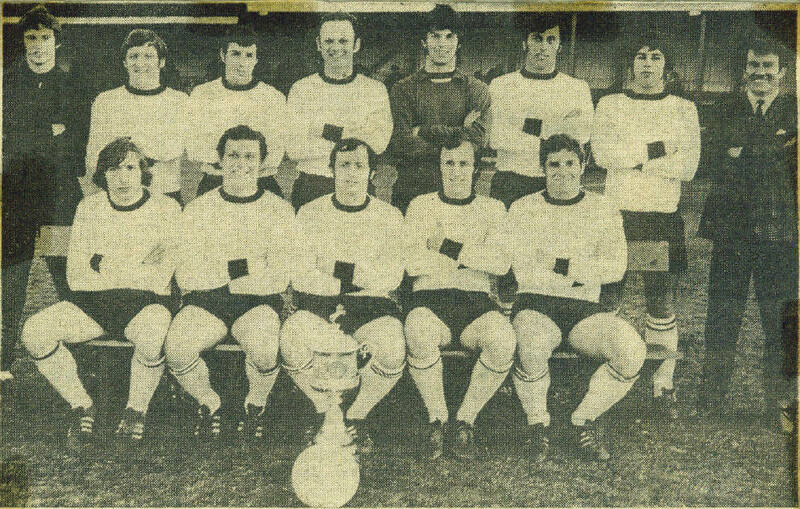 1970-71 Kent Senior Cup winners. Two days after winning the Kent Senior Cup, beating Dartford 3-2 on aggregate in the final, Dover beat Gloucester City 5-1 at Crabble. This picture was taken before that game, on Friday, 30th.April, 1971. Back row (left to right): Alan Fursdon, Keith Robinson, Mick Cartwright, John Carragher, Keith Bowley, Chris Hurley, Les Hall, John Arnott. Front row (left to right): Dave Armstrong, Colin Clewlow, Tony Moy, Barry Gould, Mike Harrison.